Organizations now seem to be focusing on what values are shared, what binds different populations and cultures together, whilst enriching their identities through differences. So how can organizations attain diversity whilst at the same time feel inclusivity? 0ne has become very aware of the after-effects of the terrorist attacks all across the world. And we had the economic crisis a while back — enough stimuli to go for a trusted environment with not too much diversity around. You can’t really trust “foreign” cultures in the broadest sense of the word. People look out for the familiar. This had led to an ever-increasing polarization: Republicans versus Democrats, Christianity versus Islam, Left versus Right, USA versus Russia etc. And we have political leaders who thrive on bi-polarity with dangerous super players as Trump, Erdogan, Kim Jung-un and Duterte. However, business is looking for new alternatives. It is quite striking that many Western organizations have been looking for programs that help them move beyond diversity. And now it is the turn for Asian organizations. They seem to be looking for inclusion but not inclusion where we feel as one big family because we are all similar in values and behavior. After having devoted much attention to the issues pertaining to diversity, organizations now seem to be focusing on what values are shared, what binds different populations and cultures together, whilst enriching their identities through differences. How can one attain diversity whilst at the same time feel inclusivity? Let’s look at the pendulum metaphor. You can focus on the ball swinging in the diverse areas of life and values. But the pendulum is only effective when the nail at the top holds everything together. If the nail is as big as the pendulum we have inclusion without diversity. If the nail snaps, we have lots of diversity without inclusion. Both are pathologies. Thus, how to adopt global strategies locally or how to decentralize the central are the key competencies of today’s leaders. While diversity programs have taught us how to respect diverse cultures, inclusion will help people to know what we share. 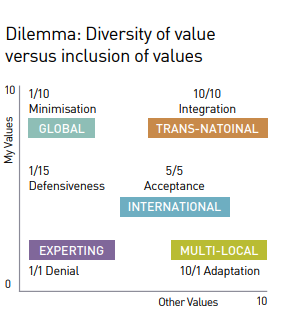 The way an organization reconciles inclusive values with diverse values is a measure of its maturity and performance — one of the main competencies underlying this maturity is the degree to which it can reconcile cultural differences. This is very much in line with the thinking of Milton Bennett (1986) who developed the Developmental Model of Intercultural Sensitivity (DMIS) in which six phases of intercultural sensitivity are distinguished — the larger the sensitivity, the bigger the chance that the organization is taking advantage of cultural diversity. The first three phases are ethnocentric. Here, people unconsciously experience their own culture as “central to reality.” The most basic form of ethnocentrism is best summarized in the first phase of denial. In this phase, people are not yet able to see or experience cultural differences. There are no alternatives to their own logic, and if there are any, they are seen as of less value or even inhumane. You can still find this attitude among managers in the Midwest of the US, for example, who will tell you “If we all just speak English everything will be OK.” These people have never experienced a culture shock (and very likely will not), which is in great contrast to the people who surround them. They resolve cultural diversities by isolation or separation, like the Apartheid in South Africa. These managers have no clue about their own culture because they lack any impetus which urges them to find out about themselves. If we look at the following chart, we can see on the Y-axis “My values” and on the X-axis “Other Values.” This first phase of denial can be put on the 1–1 position. These people and the organizations they represent don’t know any other values and, therefore, lack any understanding of their own values. This type of organization typically operates in one nation. The best they do, perhaps, is export goods to nations that they will never visit. A second ethnocentric phase is one of defensiveness. In this phase, people do experience cultural diversity, however, the world is immediately divided into “us” and “them,” whereby “us” is, of course, superior to “them.” This is typified by an internationalizing manager who is convinced that his organization (and the technology it represents) is the very best. Local differences are not really appreciated. If the threat of the defensive phase is being reduced by the assumption that, at the core, all persons are equal, one then enters the phase of minimization. 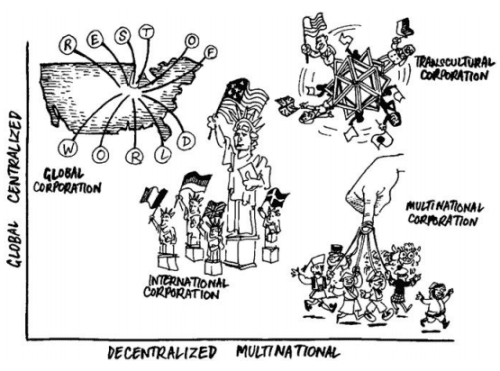 This final level of ethnocentrism is approached in the so-called global organization, if we use the terminology used by Goshal and Bartlett (1998). One sees that cultural differences exist, and are tolerated, but a strong corporate culture, such as IBM, HP and Proctor and Gamble or GE, creates a strong pressure towards conformity. The last but one phase is referred to as adaptation. Managers are able to look at the world through different lenses. They adapt easily to changing local circumstances. The Anglo-Dutch companies like the Royal Dutch Shell and Unilever (not by coincidence both bi-national organizations) are good examples of this group. And work gets done in the Multi-National Organization. Their managers are used to doing “In Rome as the Romans do”. Their organizations are easy to recognize, because they put a lot of effort into language training, and have many traditional cross-cultural training programs such as “doing business with the Japanese.” In global organizations, there is a strong drive towards standardization and management teams consist purely of nationals who have grown the business from home. Bennet has characterized the first phase in Ethno-relativity as the phase of acceptance. The managers of the organization have, through longstanding international contacts, understood that they have their own cultural context determining their behaviors, and that other cultures give meaning to their lives in other ways. These organizations pay serious attention to attracting staff from different and diverse cultures, and will fully understand the value of cultural diversity, far beyond the formal rule-based interpretation of diversity that we see so often. The top management in such organizations will, however, still typically consist of nationals from the country where headquarters are based, but there will be one or two exceptions. A good example of this International Organization (Ghoshal and Bartlett, 1998) is Walt Disney, which relates slightly to the countries – France and Japan – where it also have its theme parks. In our experience, it is possible to help the growth towards the integral organization in which values are reconciled into something that everyone shares. First of all, attention needs to be given to the diversity of values that distinguishes one group from another. Once these diverse viewpoints are known, the process of respect needs to sink in. When differences are acknowledged and respected, it is time to integrate these values into a hyper-culture of things shared. It is possible to help the growth towards the integral organization in which values are reconciled into something that everyone shares? The Transcultural or Integral Organization is cut like a diamond of which it is very difficult to determine the top. They do combine opposites of which diversity and inclusion is the most generic one. So if we take our seven meta-opposites (as described in Riding the Waves of Culture) they encompass possibly seven dualities that are reconciled as follows: “We standardize our best customization”; “We strive for teams that consists of creative individuals”; “We are passionately controlling our emotions”; “We give people direct feedback with diplomacy”; “We act as servant leaders”; “We speed up sequences by synchrony”; and “We push our technology through the pull of the Market”. How can we embed these dual or yin and yang values in the desired behaviors and behavioral competencies that need to be established within the organization for which the responsibility lies with the leaders of the organization? Here too, we see a clear difference between the segmented multi-local and the global brand. Take for example the brand experience of Merrill Lynch. In the US, Merrill is seen as large but 'middle of the road'. In Europe, one sees a changing picture while in Asia everything is being done to belong to the top of the brands. In this sense, Goldman Sachs is a global brand name that is counted among the most selective financial institutions regardless of the continent. The transcultural organization also requires a change in the approach to which we position our brand name. The essence of the message is that we make a global approach locally attractive and meaningful. Is it not interesting to see that the award-winning advertising campaign HSBC has made this philosophy the core of his message? It's all about bringing together points of view. Their campaign, which has received the significant title "connecting viewpoints" is based on the different local interpretations of objects and people. They have done it so effectively that the message has no cultural bias and is very popular in the US, Europe and Asia and does not compromise their mission to become the world's local bank. So, what can leaders do? The examples above are typically organizational. 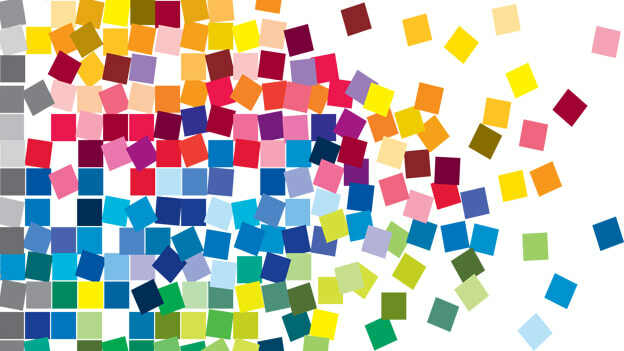 To enhance diversity and inclusion, an organizational context of dualities in values and branding that connects both difference and sameness by being the world’s local something, is very helpful. But if a leader doesn’t feel there is time to go through that top-level process, what can one do tomorrow on an individual level? And what can HR do to help? Rewards. There is nothing more deadly for combining diversity and inclusion than a lagging remuneration structure. Take the example of a large oil company. At first there were mainly British, Americans and Germans working there. The group sought cooperation with a Japanese party within its Research & Development department. After the agreement was concluded, teams of people with a completely different cultural background had to work together. This led to in-depth discussions about the remuneration structure. Individual bonuses were one option. Especially the Americans and the British would work even harder with this system, but the more Japanese and Germans focused on the group would be seriously demotivated. Another option was to provide group bonuses. Wonderful for the Japanese, but for the Anglo-Saxon staff there would be no incentive for that. The either-or-option was therefore discarded. Then perhaps one-and-one? A compromise whereby half of the bonus is awarded on the basis of individual performance and the other half for the performance of the team? Then perhaps one half would be stimulated by one and the other half by the other. But this one-and-one option did not make it either. Instead, the positive of individual competition was ingeniously reconciled with the good of cooperation within the team. A mixed bonus system was introduced. On the understanding that individual employees could only receive a bonus if their team had proclaimed them the best team players. In addition, teams had to show how they had tried to get the best out of their individual members. An independent audience then chose the best team. The system works well and is an example of something we will see much more often: ‘co-opetition’ — competition to improve cooperation and cooperation to achieve better competition. The new reward system made the diverse groups inclusive. Appraisal. In the late nineties, Motorola introduced an interesting process to stimulate a dialogue between a boss and a subordinate under the title ‘Individual Dignity Entitlement’. A number of times a year a dialogue unfolds around six important questions, such as: 'Is the work you do meaningful? "And: 'Do you have enough resources to fulfill your tasks?' Yes or no are the alternative answers. With 'yes' as the answer, there is no dialogue, but with 'no', there has to be a dialogue about how to get yes in the next period. This system launched by Motorola's CEO in Chicago proved not only to be an excellent tool that led to relevant conversations between boss and subordinate, but also produced a number of quantifiable yes's and no's. In short, it worked pretty well in the United States, where transparency and quantifiability have a motivating effect. But how to explain that the ‘yes’ scores were 98% in South Korea? And that on a site where the local chip production was anything but successful. After a number of interviews with the Koreans, it quickly became clear that they appreciated the system introduced by the head office. It was only the American specificity of the videos and books that influenced the effectiveness. Why only yes or no? In Korea, the answer to the boss is always yes, regardless of the nature of the question. And why was there a need to measure and publish those yes’s and no's? However, the quality of the underlying philosophy was praised. In parts of Asia, the system was introduced with similar questions. But the dichotomous yes/no has been replaced by a scale, so the 90% ‘yes’ is a subtle indicator for the Korean ‘no’. Perhaps the most appealing is the example of McDonald’s, the bastion of global standardization. Even McDonald’s has to deal with the limitations of that policy. If they want to spread the gold M around the world, they will have to pay more attention to local flavors — soy sauce and no mayonnaise; rice and no potatoes; fish and no meat; McKroket next to the burger. Ironically, the international division of McDonald’s with its diverse offerings is most profitable. Moreover, most ideas come from the local and regional organizations and the best are standardized. Diverse foods lead to inclusive offerings. If there is hope for McDonald's, there is hope for everyone. Effective integral organizations are aware of the values they bind, realize the most important differences in the regions, and have leaders who both connect. The quality of the nail determines how much swing can be given to the ball and the quality of the rope is determined by the intercultural competence of the leaders. Can dilemma competence be developed or is it innate? Our thinking is that values are not “added” by leaders, since only simple values “add up”. Leaders combine values: a fast and a safe car, good food yet easy to prepare, functional yet beautiful. Nobody claims that combining values is easy, but it is possible. A computer that is able to make complex calculations can also be customer friendly. Obviously hi-tech should not replace hi-touch. It is in the unique combination of technology and face-to-face interventions that the integral leader makes organizations perform better. It is the more extended systems of values that will be the context in which integral leadership will prove its excellence. From our extensive, reflective critique of our evidence, we conclude that the newly identified competence of reconciling dilemmas is not simply just learned or innate. It needs a systemic approach. The whole organization needs to provide a framework that supports, stimulates and facilitates people to reconcile diversity and inclusion. We have seen individuals with high potential, yet not able to progress further than a (lose-lose) compromise because their work environment did not appreciate creative solutions. Conversely, we have found less effective individuals that achieved significant reconciliation by their stimulating and supportive environment. So, how to create such an environment? It begins with leaders who practice what they preach. And it is of utmost importance that rewards are created that motivate individuals and diverse teams. It is about linking reconciliation to business issues and business results and making it into a continuous process so that it becomes a way of living rather than a conceptual exercise.